Tech. Sgt. 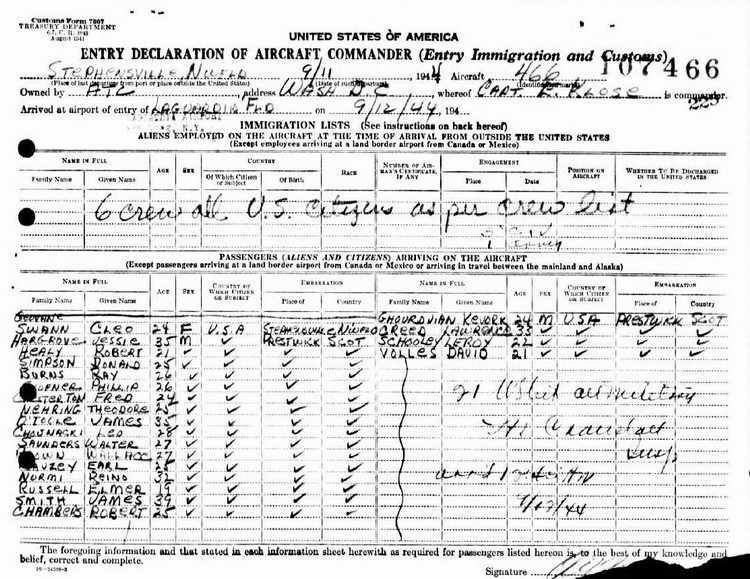 Frederick E. Chesterton, brother of Mrs. Mildred N. Valerio, 161 Shelter St., was wounded slightly in action in France, June 27, according to a telegram from the War Department. The 23-year-old paratrooper has been overseas since last November. He entered the Army in September, 1942, and trained at Fort Benning. He was commended for bravery in battle by his divisional commander. Before entering the service Sergeant Chesterton, a graduate of West High School, was employed by Bausch & Lomb Optical Company in their experimental laboratory His brother Gunners Mate 2-c Gilbert F. Chesterton, is a member of a PT boat crew operating along the French coast. 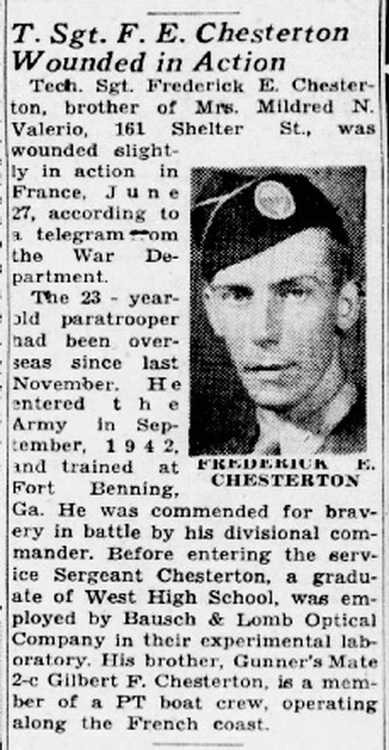 Frederick E. Chesterton enlisted in the Army at Rochester, NY on 15 September 1942 and became a member of Company C, 508th PIR. T4 Chesterton was injured in action on 27 June 1944 and evacuated to a field hospital in Scotland. 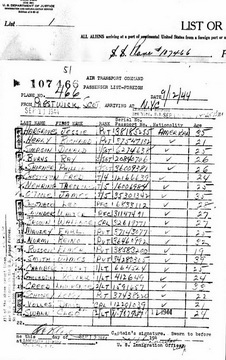 On 12 September 1944 he was flown from Prestwick, Scotland to Stevensville, Newfoundland where the aircraft was refueled. He then proceeded to LaGuardia Airport, New York City. T4 Chesterton received additional treatment in the United States and was discharged on 17 December 1944. He married his sweetheart, Mary Elizabeth Mahon, 2 weeks later. Oct 25, 1986 in Buffalo V.A. Hospital. 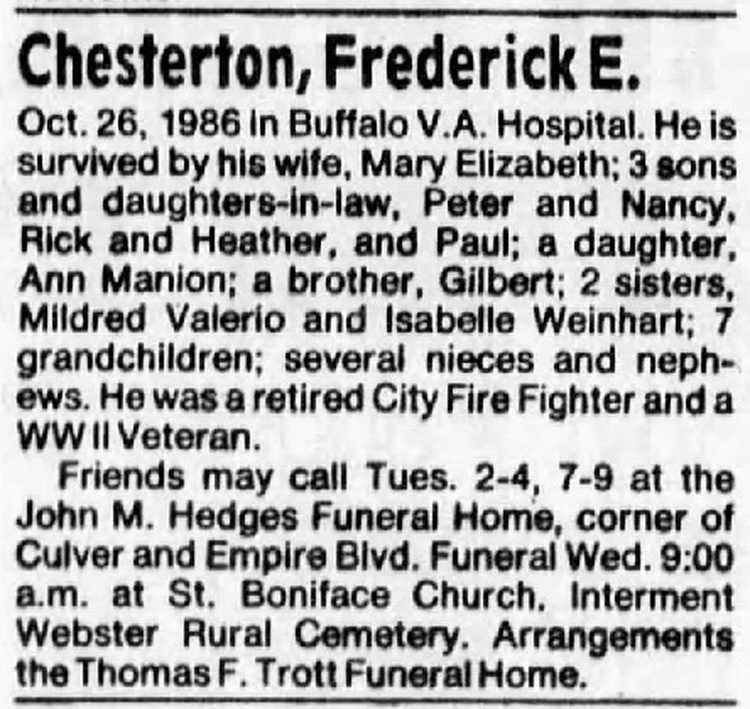 He is survived by his wife, Mary Elizabeth; 3 sons and daughters-in-law, Peter and Nancy, Rick ad Heathers, and Paul; a daughter Ann Manion a brother, Gilbert; 2 sisters, Mildred Valerio, Isabelle Weinhart; 7 grandchildren; several nieces and nephews. He was a retired city firefighter and a WWII veteran. Friends may call Tues. 2-4, 7-9 at John M. Hedges Funeral Home, corner of Culver and empire Blvd. Funeral Wed. 9:00 a.m. at St. Boniface Church. Interment Webster Rural Cemetery. Arrangements the Thomas F. Trott Funeral Home. HANDY MAN around a fire station is Frederick Chesterton. He is equally adept as chef for fellow firemen or as a firefighter. His Dalmatian pal is Tommy, station 1 mascot. Here's one man who really does jump from the frying pan into the fire. Frederick Chesterton of 153 Averill Ave. does it many times a year. He gets away with it, too. 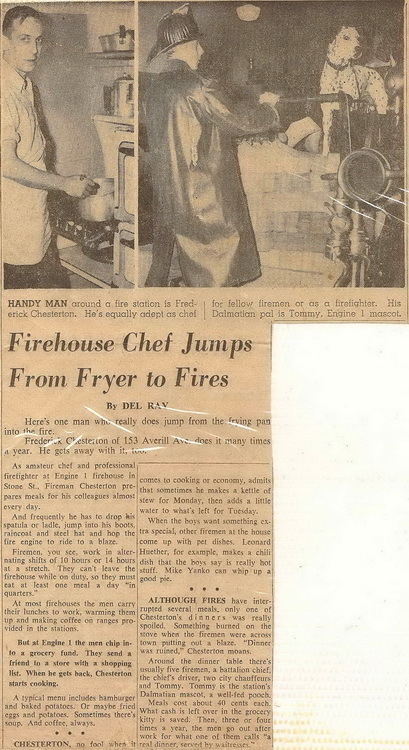 As amateur chef and processional firefighter at Engine 1 firehouse in Stone St., Fireman Chesterton prepares meals for his colleagues almost every day. Firemen you see, work in alternating shifts of 10 or 14 hours at a stretch. They can't leave the firehouse while on duty, so they must eat at lest one meal a day "in quarters." At most firehouses the men carry their lunches to work, warming them up and making coffee on ranges provided in the stations. But at Engine 1, the men chip into a grocery fund. They send a friend to a store with a shopping list. When he gets back, Chesterton starts cooking. A typical meal includes hamburger and baked potatoes. Or, maybe fried eggs and potatoes. Sometimes there's soup. and coffee, always..
Chesterton, no fool when it comes to cooking or economy, admits that sometimes he makes a kettle of stew for Monday, then adds a little water to what's left for Tuesday. When the boys want something extra special, other firemen come up with pet dishes. Leonard Heuther, for example, makes a chili dish that the boys say is really hot stuff. Mike Yanko can whop up a good pir. ALTHOUGH FIRES have interrupted several meals, only one of Chesterton's dinners was really spoiled. Something burned on the stove when the firemen were across town putting out a blaze. "Dinner was ruined," Chesterton moans. Around the dinner table there's usually five firemen, a battalion chief, the chief's driver, two city chauffeurs and Tommy. Tommy is the station's Dalmatian mascot, a well-fed pooch. Meals cost about 40 cents each. What cash is left over in the grocery kitty is saved. Then, three or four times a year, the men go out after work for what one of them calls "a real dinner served by waitresses."